Curtis Jobling’s children book from 2001, Frankenstein’s Cat, has been turned into a digital 2D cartoon series by UK-based animation house MacKinnon & Saunders, known for their work on such titles as The Corpse Bride, Mars Attacks! and a wonderful horror short called The Peri-wig Maker. Kayenta Production of France and CCI Entertainment are co-producers. 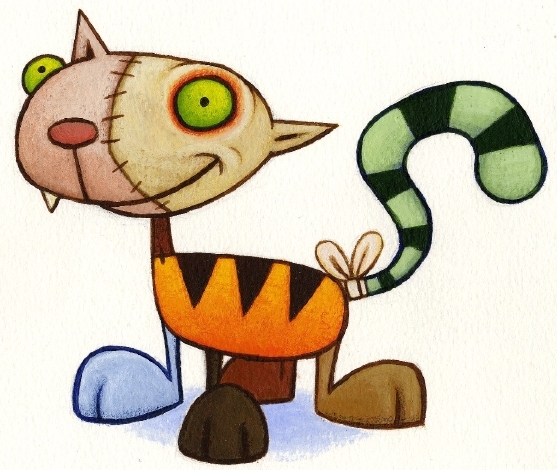 This patchwork feline with detachable body parts (“You’ll love him to bits!”) is called Nine because that's how many cats it took to make him. He shares his adventures with his soul mate, a lonely little girl named Lottie. The English version comes to Britain’s CBBC in February. No word yet on a North American showing. There was also a 1942 theatrical cartoon called Frankenstein’s Cat, the second Mighty Mouse adventure from Terrytoons and 20th Century Fox. Directly inspired by Siegel and Shuster’s Superman (created in 1938), complete with identical super powers and a blue costume, the Limburger-powered Mighty Mouse caught on. The character would eventually become a 50’s TV favorite, streamlined, buffed-up and upgraded with own distinctive yellow outfit. Terrytoons’ Frankenstein’s Cat is a rampaging, lightning-fueled robot with a square-top cat’s head. 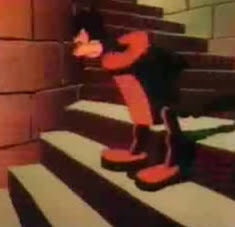 Animators referenced the Universal classics: Birds and mice villagers form a torch-bearing mob, Frankenstein’s castle has the same winding stone staircase that Boris Karloff threaded and, in a scene out of The Bride of Frankenstein, the cat monster is upset by his own reflection in a pond. Both Frankenstein cats can be seen on YouTube. Here’s a trailer for Curtis Jobling’s new version, and the original Mighty Mouse cartoon can be seen in its entirety. Curtis Jobling’s website, and blog. Awww... he's so cute and coloured! Thanks for the cat and the links. Hey, Bibi! Great to see you posting on Bibi's Box again!